Parents can be the worst, a fact just about everyone clues into right around the time they hit puberty, but don’t really understand fully until later in life. Sure, they support, love, and even just put up with you, but the older you get, the less you see your parents as caretakers put on this earth solely for your benefit, and the more they start to look like a funhouse mirror reflection of yourself, warts and all. While still basking in the afterglow of their engagement, Leslie and Ben have to face that they’ve taken a big step towards becoming parents themselves, despite both coming from non-traditional families. Leslie’s father has been dead for who knows how long, and Ben’s parents… well, they wouldn’t necessarily mind the demise of one another. A party brings the Knopes and Wyatts together under one roof, but as the title of this week’s episode of Parks and Recreation suggests, “Ben’s Parents” are the ones responsible for delivering a graduate thesis on familial tension. Despite how humbling running your hometown’s economy into the ground must be for a sixteen year-old, Ben’s timid nature was always going to trace back to his childhood. The seeds for the reveal were planted more than a season ago, with Ben proudly explaining he learned his passive-aggressive problem-solving from his parents. “And they’ve been… divorced for thirty years.” It’s the kind of imprint parents make that is the most frustrating: you can see their flaws bright as day, but can’t help but to repeat them yourself, because that’s what they taught you. It can seem almost impossible to undo the kinds of habits you pick up from people you’ve spent most of your life with, but the best way to fight them is by letting someone else rub off on you. Leslie Knope is the person to inspire such change. Among the many things truly special about her is her ability to positively shape people around her for the better. 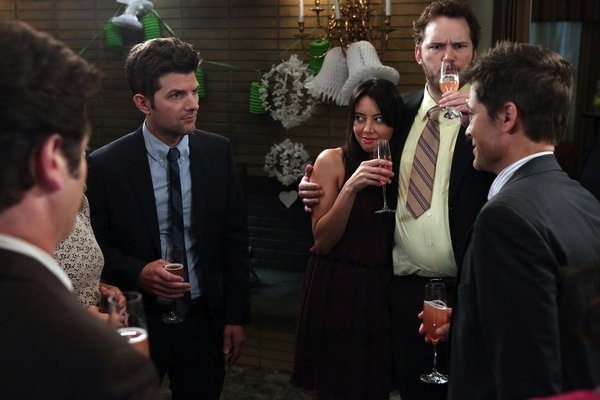 Every member of the Parks department has grown over the show’s run because of being around Leslie, whether it’s Ron getting involved in the personal lives of his co-workers, or April wearing a dress unironically. She’s such a positive, unstoppable force of nature, even her own mother, who was first introduced as doubtful of her daughter’s capabilities, has softened under her influence. Leslie exists to fix things, be they problems or people, and who’s spent more time with her lately than Ben? The Knope gene for backbone infected him enough to make Ben propose, so how bad could the meeting of mama and papa Wyatt really be? As it turns out, a complete disaster, seeing as Ben’s mother (Glenne Headly) is a soft-spoken and snippy shrew, and Ben’s dad is Mike “The Cleaner” Ehrmantraut. Okay that’s not actually the name of the character Jonathan Banks plays (I think it’s Steve), but for millions of Breaking Bad fans, he’ll always be that same, grim hitman from Albuquerque, and rather than try to change that image, Parks embraces it. There aren’t quite so many direct homages to his previous role the way clever nods hinted at Bradley Whitford’s West Wing career last season, but with that same deadpan delivery and gravely voice, a line like, “we’re a Twizzler family,” makes the character unmistakably like Mike. Luckily for Ben, Leslie isn’t the type to deal in half measures, so her plan to keep the engagement party running smoothly is to divide and conquer, keeping Mrs. Wyatt busy with Marlene Knope (Pamela Reed), while distracting Ben’s dad with white, Minnesotan-worthy chatter. Failing that, Leslie’s industrious arts and crafts expertise will save the day, in the form of a unifying family quilt, with squares representing every important family member (and HBO series) in the Wyatt-Knope alliance. For a moment, it looks like everything is going to be alright, until the two heads of the Wyatt family finally collide, along with an uninvited guest, in the form of Steve’s new wife, Ulani. The maelstrom of sniping and insults is about as horribly awkward as you’d imagine, and “Ben’s Parents” plays the conflict pretty straight. You know almost as soon as you see Leslie’s beautiful quilt that it won’t survive the night intact, and sure enough, its destruction causes Leslie to uncharacteristically admit defeat, with the announcement that Steve has gotten Ulani pregnant being the last push she needs to accept Ben’s escape plan: get into a cab, and head for Australia. But in another seemingly uncharacteristic turn, it’s Ben who refuses to run away from the problem, forcing his parents to sit down like something closely approximating adults, and admit that their own years of bitter contempt won’t poison the new loving ones he and Leslie plan to share. Ben’s parents don’t leave him with much wisdom as to a happy marriage during his big day, but doing everything he can to not follow in their footsteps is the boldest, best move he can make, and he gets the courage to do so because of Leslie. In the same vein, Ben’s meekness has caused Leslie to develop into less of a bulldozer when it comes to making sure everything is perfect, and accepting imperfection is vital to any relationship. Through this symbiosis, and the lessons she’s learned from the happy, yet too short marriage of her parents, they’ve got a real shot at not going down the path of the elder Wyatts, because, as Marlene Knope puts so elegantly, they’re both on the same team.